WEDNESDAY, Aug. 1, 2018 -- Nut intake reduces hemoglobin A1c (HbA1c) among individuals with type 2 diabetes, according to a study published in the August issue of Diabetologia. David J.A. Jenkins, M.D., Ph.D., Sc.D., from the University of Toronto, and colleagues presented data from a paper that they earlier retracted owing to lack of adjustment for repeated measures in the same individual. The authors fixed the previous statistical error and added new data of interest, including low-density lipoprotein (LDL) particle size and clotting factors. Data were included for 117 men and postmenopausal women with type 2 diabetes taking oral glucose-lowering agents and with HbA1c between 6.5 and 8.0 percent. Participants were randomized to full-dose nut diet (477 per 2,000 kcal energy provided as mixed nuts), full-dose muffin diet (471 per 2,000 kcal energy provided as whole-wheat muffins, with similar protein content as the nuts), or half-dose nut diet (474 of 2,000 kcal energy provided as half portions of nuts and muffins). Post-intervention data were available for 108 participants. The researchers found that the full-dose nut diet provided 9.2 percent greater total energy intake from monounsaturated fat compared with the full-dose muffin diet. The full-dose nut diet reduced HbA1c by −0.19 percent compared with the full-dose muffin diet. After the full-dose nut diet there were also reductions in the estimated cholesterol levels in LDL particles with a diameter <255 ångströms and apolipoprotein B. 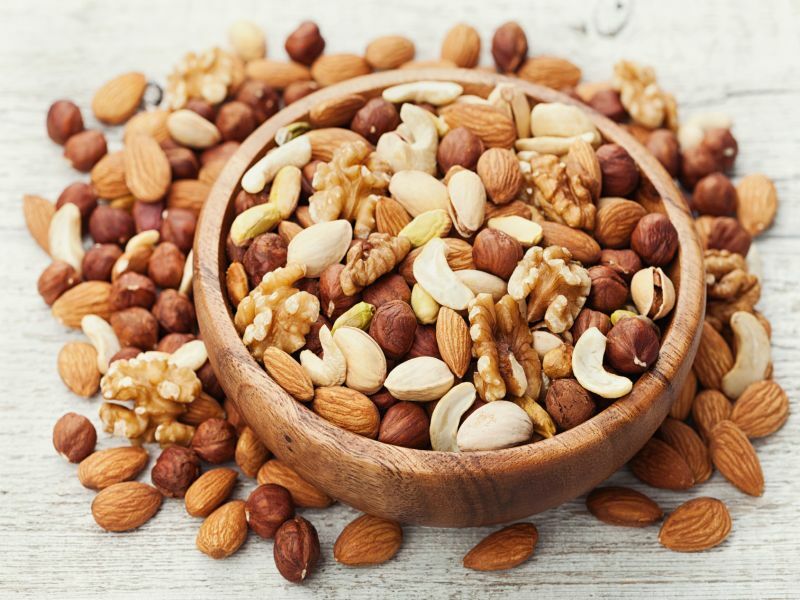 "Nut intake as a replacement for carbohydrate consumption improves glycemic control and lipid risk factors in individuals with type 2 diabetes," the authors write. Several authors disclosed financial ties to the pharmaceutical and nutrition industries; the study was partially funded by the International Tree Nut Council Nutrition Research & Education Foundation.